Last Monday, November 23rd STINAPA celebrated the 6th tree planting festival (Festival di Planta Palu). 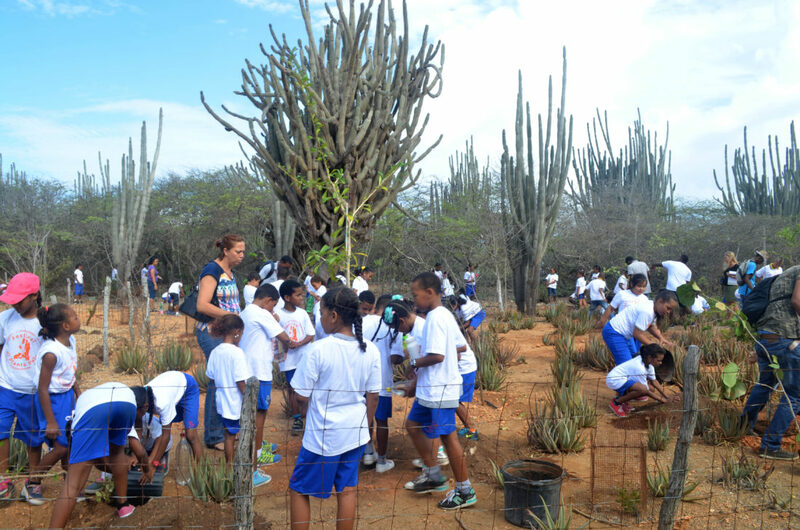 Students of grade 5 of all the elementary schools over 100 trees at the entrance of the Washington Slagbaai National Park. Desiree Croes, coordinator of the Department of Nature and Environmental Education, opened with a welcome speech to the students. Governor Rijna and commissionar Dirksz also attended the event. Students then sang the Festival di planta Palu song and prizes were awarded to the winners of the drawing contest: ‘Draw your fantasy tree’. The overall winner was Johan Valencia Riascos Torres from Kolegio Rayo di Solo. Andi from Kolegio Strea Briante. Corbin Pourier from Pelikaan School. Students from the Aquamarijn School made a poem. After presentation of the prizes, the trees were planted by the students under the supervision of their teachers, a group of youths from FORMA and also members of Echo Foundation. Wayaka Kibrahacha, Watakeli, Druif’i Laman, kalbas, Pal’i Sia, Kenepa, Shimaruku, Oliba and Hoba trees were planted all over the park entrance area. By planting these native trees, STINAPA is restoring the biodiversity in the Washington Slagbaai National Park. STINAPA is very grateful to everyone who helped to make a success of this event. A special thanks goes to Kentucky Fried Chicken which sponsored gifts and also thanks to Forma, Echo Foundation and all the volunteers.